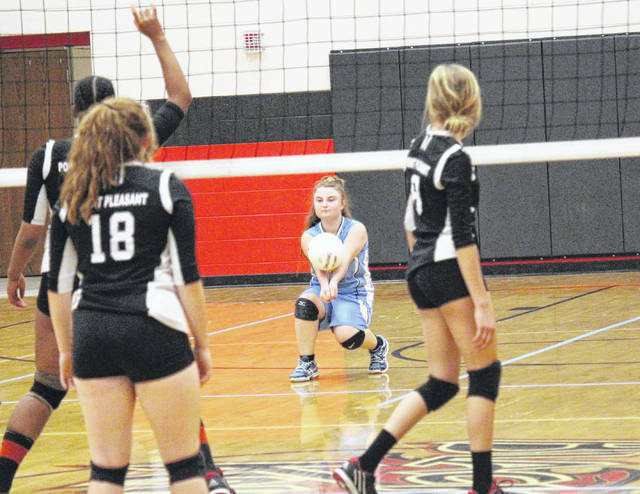 Ohio Valley Christian School’s Marcie Kessinger returns a serve during the Lady Defenders’ volleyball match against Point Pleasant on Tuesday in Point Pleasant, W.Va.
POINT PLEASANT, W.Va. — If you witnessed this — or something similar — just a week ago, you are correct. On Thursday of last week, the Point Pleasant High School volleyball squad swept host Ohio Valley Christian School in straight games. On Tuesday, only this time at Point Pleasant, it was a similar sweep — as the Lady Knights notched a 25-12, 25-18 and 25-14 triumph over the visiting Lady Defenders. And, in both affairs, the eight-lady Defenders did play Point Pleasant tough and gave a good effort —even taking a lead as late as 9-7 in the third and final set. But the Lady Knights, and almost anybody watching, knew they had an overwhelming advantage in size, strength, power, experience and just plain overall talent. While the Defenders did hang around in all three games early on, Point Pleasant picked up the pace as the sets went along, and ended up pulling away in each. With the victory, the Lady Knights — having also swept Mason County rival Wahama in between the two OVCS tilts —raised their record to 15-3. The Defenders fell to below .500 at 8-9, but do remain alive in Ohio Christian School Athletic Association tournament action after defeating Genoa Christian on Saturday. In fact, they are the defending OCSAA state runners-up. Point Pleasant’s tall hitters had the attack working again on Tuesday, as Lanea Cochran led the winners with a match-high 10 kills, followed by Brenna Dotson with eight and Olivia Dotson with five. Brenna Dotson delivered three blocks, while Cochran and Olivia Dotson each had two. Gracie Cottrill with 14 assists and Olivia Dotson with 13 helpers were the primary setters for the Lady Knights. In game one, OVCS’ only lead was at 1-0, followed by two ties at 1-1 and 2-2. Point Pleasant led from 2-1 on, scoring four consecutive points to lead 6-2 before eight straight service points by Peyton Jordan —including three aces in a row —made it 15-3. The Defenders did get four straight points to make it 19-9, including an Emily Childers block-kill, but the Lady Knights netted six of the final nine points to win the first set 25-12. In the second set, the Defenders held slim 2-1 and 3-2 leads around 1-1, 2-2 and 3-3 ties, but four more Jordan service points put the Lady Knights in front 7-3. The Defenders then only trailed by three six times (6-3, 7-4, 8-5, 9-6, 10-7 and 11-8), as an ace by Cori Hutchison had OVCS within two at 9-7. But Point Pleasant, behind four straight service points by Cottrill on four OVCS errors, ran off seven of the next eight points —doubling the lead to 16-8. OVCS got to within 22-17 with four straight points, but kills by Brenna Dotson, Cochran and Cottrill finished off the game at 25-18. In the third game, there were actually three lead changes and six ties, as one of Marcy Kessinger’s two aces gave the Defenders a 9-7 advantage. But the Lady Knights scored six straight, then pulled away from a 14-12 cushion by reeling off 11 of the final 13 points to take the match. A pair of Olivia Dotson aces, sandwiched around a Brenna Dotson kill, closed the contest out. Cottrill and Tristan Wilson wound up with three kills apiece, as the libero Jordan led in digs with nine while Cottrill chipped in seven. Olivia Dotson and Madison Hatfield had six digs apiece. For OVCS, which fell 25-14, 25-11 and 25-19 in the opening meeting against PPHS, Hutchison and Katie Westfall finished with five kills apiece — as Hutchison added two aces and Westfall served one. The Lady Knights return home, and host Teays Valley Christian, on Monday at 6 p.m.